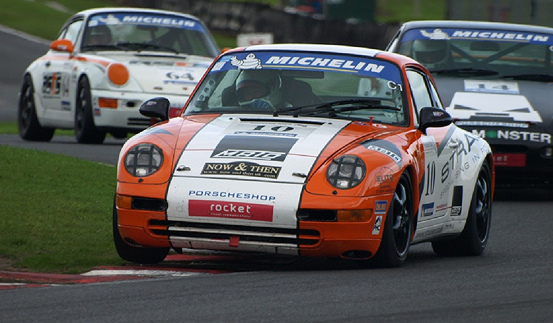 Richard Ellis brought the No.10 Strasse Racing Porsche 993 C2 across the Oulton Park finish line 2nd in Saturday's second race of the day in the Porsche Club GB Championship. The result secured the Yorkshire resident his first ever podium finish in the championship. Champion Chris Dyer once again was faultless in both races and and takes overall Championship points. With both Eleven and Twelve rounds taking place on the same day it was going to be an hectic day especially for David Botterhill who was also racing in the BRSCC Northern Championship.the Team arrived Friday for testing, Richard Ellis was pleased with his car stating "The car feels good and the set-up is good, testing went well" Chris Dyer opted out of the testing in order to save tyres for qualifying and the two races. Oulton Park with it's high and low elevations is a fast and twisting track with no room for driver error making it hard for overtaking so everyone was out to qualify high up the starting grid, Dyer put in an impressive 1.59.693 to put him 10th overall on start line but class two rival Marcus Carniel put in a 1.57.300 that placed him three rows in front for the start of race one. Dyer stated "If we drive that fast during the race it's going to to be a scary race". 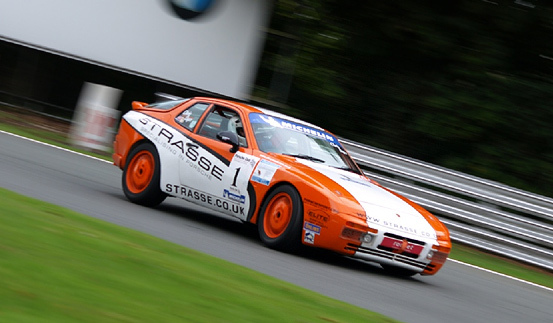 Richard Ellis secured a fourth row start with a 1.58.196 while David Botterhill in the Porsche 964 was slightly off the pace placing behind Dyer with a 2.00431 placing him on row six. Dyer, the 2010 champion began his attack at the green light and with Dyers championship rival and overall points leader Mark Sumpter starting on the first row Dyer was hoping to close the 11 point gap, He didn't have to wait long has Sumpter made a mad dash attempt to undertake Mark Mcaleer going into Shell Oils Corner leaving him beached in the gravel trap. This brought out the safety car and Sumpter was pulled from the gravel but joined the race two laps down. At the restart all the cars got away safely but the Class two pole sitter Marcus Carniel was too fast and too far in front for dyer to be able to catch him forcing Dyer to settle for 2nd place in class 8th overall in the 21-car line up. Richard Ellis made up two places crossing the line in 6th place and David Botterhill finishing in 10th place. The grid for the second race is determined by the competitor's second fastest lap in qualifying so this put Dyer's Class rival Carniel on the front row and Dyer on row five, Ellis on row three and Botterhill on row 6, everyone got away safely and clean with Sumpter making an impressive start to lead the field some four car lengths in front. But the race soon turned into drama on the second lap as class two leader Marcus Carneil and race one winner Peter Morris got side by side down The Avenue approaching Denton's and Cascades Corner, with both drivers not giving way disaster struck has both cars at full throttle bounced off each other putting them both into multiple rolls that resulted in Peter Morris's car sumasalting in the air and over the safety barrier..both cars came to rest on there side bringing out the red flag. Thankfully both drivers where ok but where taken to hospital for check ups and treatment for minor cuts and bruises, The Oulton Park staff and marshals did a fantastic job to get the restart up and running within 15 minutes. Due to the 6.30pm curfew the race had now turned into a short 10 minute race.The green lights went out and we where soon back racing, Ellis was now into third place overall and despite the distractions of the crash Ellis was determined to challenge and claim a podium place, with only two laps to go he out braked Mark McAleer coming into Hislops and took 2nd place to the chequered flag. The rest of the field practically remained in the same formation from the restart with Chris Dyer taking the class two top spot and 8th overall and fastest lap, team mate Botterhill followed closely in 9th place. David Botterhill had been off the pace a little all day and had also taken part in both the BRSCC Northern Championship races in his Strasse sponsored 944. It soon came apparent why, soon after the last race David became very ill and was taken to hospital by ambulance, Dave stated "I'm fine now, apart from being a bit tired from lack of sleep. I didn't get released from the hospital until about 2:30 in the morning". The team and porschesport wish you a speedy recovery. Richard Ellis..."I qualified well and the car felt really good I made a few adjustments for the first race and got off to a great start making up a few places and got a good run, the car felt good throughout the race and I had couple of tussles with other drivers that made it really enjoyable. I managed to bring it home seventh, sixth in class. the second race I made some more adjustments and the car was handling a lot better but with that terrible accident it took the shine off the second place finish, but the lads are alright so that's the main thing. I had a great battle with Mark McAleer and Paul Follett for pretty much most of that race, I just had to concentrate, make no mistakes and they could not get past me.it was a good race and I really enjoyed it and am looking forward to the next round. 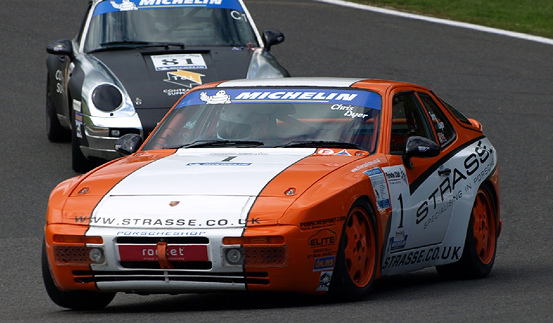 Chris Dyer..."I Qualified 10th overall, 2nd in class, after a good start i got straight up to eighth behind Paul Follet, I tried to pass a few times but he made his 968 wide, then the safety car came out when Mark Sumpter came off at Shell. I then got a good restart under the safety car and pulled a lead out from the cars behind to bring the car home 8th overall 2nd in class". RaceTwo: "I got a flying start and got up to sixth by the first corner, then due to the massive accident the race was red flagged, we then had to grid up into the orignal positions, on the restart. At the restart I got upto 7th and had a dice with Dave Botterill and Paul Winter but the shortened race only lasted for only six laps and I came home first in class and eigth overall and fastest lap".